Bacteria and archaea are under constant attack by bacteriophages. To fight back, they have evolved a diverse arsenal of protective mechanisms. The restriction/modification system is one example, where bacteria label their own genome by methylation and then destroy any unlabeled invading DNA. In the past decade, a more flexible system has been discovered that shares some of the adaptive characteristics of our own immune system. It allows bacteria and archaea to build up immunity to phages that have attacked the population in the past. This immune system is built around a genomic memory of previous phage infection. Small pieces of phage DNA, a few dozen nucleotides in length, are stored in the cell's genome (or occasionally plasmids), separated by a distinctive repeated DNA sequence, termed a CRISPR (clustered regularly interspaced short palindromic repeat). Similarly to our RNAi system, these short pieces of phage DNA are used to build phage-specific interfering RNA, which allow the cell to recognize and destroy invading phage DNA. The key to immunity is to store information on phages that are likely to attack. In the CRISPR system, this is achieved by chopping up phage DNA and saving them in the cellular genome. This process is currently the topic of intensive research and still holds many mysteries, such as the mechanism by which bacteria tell the difference between phage DNA and their own DNA. Three proteins are thought to be important in the process, termed Cas1, Cas2, and Cas4 (Cas is short for "CRISPR-associated protein). 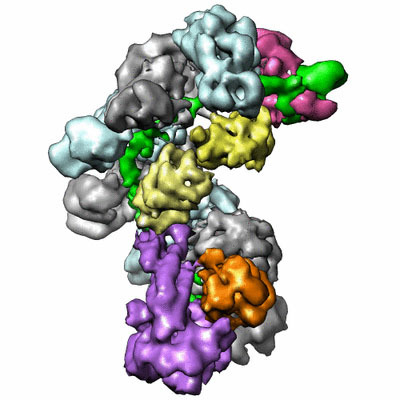 PSI researchers at MCSG have recently solved the structure of Cas4 from a hot-spring archaeon, shown here from PDB entry 4ic1. Biochemical studies have revealed that this distinctive donut-shaped enzyme unwinds the phage DNA and clips off nucleotides, creating a free single-stranded portion of the phage DNA for insertion into the CRISPR region. A host of other Cas proteins assist the CRISPR RNA in the destruction of phage genomes. Several recent studies have used electron microscopy to look at the complex. 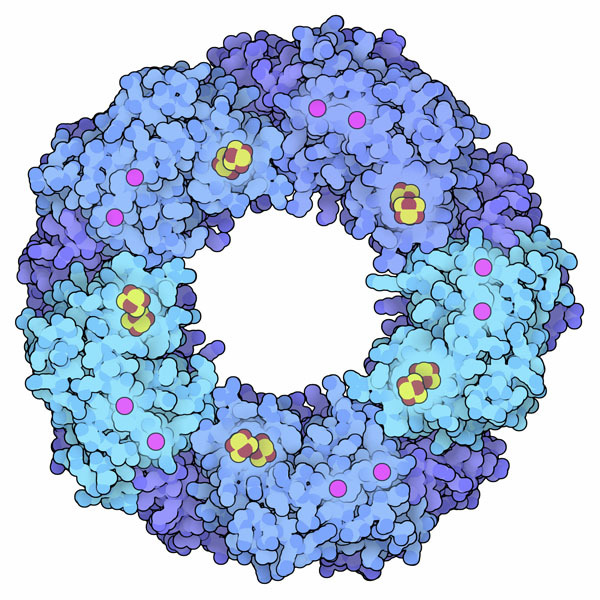 The one shown here is from Escherichia coli, termed the "Cascade" complex. It includes the small CRISPR RNA, shown in green, surrounded by a collection of proteins that will pair it with phage DNA and ultimately destroy it. You can take a closer look at this reconstruction in EMDataResource entry EMD-5314. Like many other hydrolases that act inside the cell, such as proteasomes and exosomes, the DNA-cutting active sites of Cas4 are found on the inside of the complex, creating a nanoscale compartment that limits access to only the appropriate substrates. The enzyme uses several metal ions to assist in the process: a magnesium or manganese ion is used in the DNA-clipping reaction, and an iron-sulfur cluster assists with the recognition of DNA. 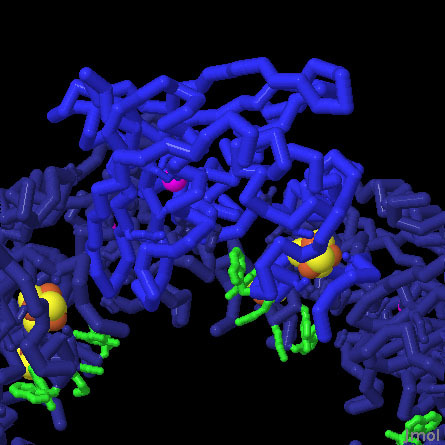 The residues colored green in this image jut into the tunnel and may act as a wedge for unwinding the DNA. Lemak, S. et. al. Toroidal structure and DNA cleavage by the CRISPR-associate [4Fe-4S] cluster containing Cas4 nuclease SSO0001 from Sulfolobus solfataricus. JACS 135, 17476-17487 (2013). Zhang, J., Kasciukovic, T. & White, M. F. The CRISPR associated protein Cas4 is a 5' to 3' DNA exonuclease with and iron-sulfur cluster. PLoS One 7(10), e47232 (2012). Wiedenheft, B. et al. Structure of the RNA-guided surveillance complex from a bacterial immune system. Nature 477, 486-489 (2011). Sorek, R., Kunin, V. & Hugenholtz, P. CRISPR--a widespread system that provides acquired resistance against phages in bacteria and archaea. Nat. Rev. Microbiol. 6, 181-186 (2008).